For those who haven’t heard yet (though it’s been all over the news), Seagate is going to make a comeback with these drives! These new models are a hybrid between traditional hard drives with platters and new SSD drives with NAND flash memory chips. This drive incorporates 250, 320, or 500 GB of traditional storage space, along with 4GB of SLC NAND flash memory installed. Through firmware, the files most used will be stored within the 4GB sector for optimal performance to achieve what full SSD’s are capable of. 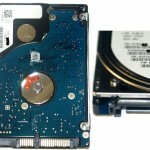 The traditional part of the drive is a 7200RPM drive with 32MB of cashe, and it’s connection for 3Gbps SATA. It’s also in the 2.5″ form factor. This drive outperforms traditional drives, but not SSD’s. However, the price of one is nearly that of a traditional drive for much better performance without sacrificing the wallet. It’s recommended to get two of these in a RAID. The fact that this drive is a hybrid, disqualifies it for some benefits of a true SSD: it is not shock resistant, generates some heat, and draws more power (even more than platter discs depending on operation). However, the 4GB of SLC NAND is top of the line memory. This little sector is rated to read/write faster than most mainstream SSD’s out there, though you wouldn’t be utilizing the write function manually. Some ask about possibility of the NAND failing, and Seagate has assured that the drive would simply continue to function as a traditional drive, with no data loss as the data on the NAND are copies only. It’s benchmarks aren’t that impressive, but due to how the drive has to get to know the user, optimal performance wouldn’t be apparent until around the 3rd reboot. This entry was posted	on Monday, May 24th, 2010 at 8:51 PM	and is filed under News. You can follow any responses to this entry through the RSS 2.0 feed. You can leave a response, or trackback from your own site.